Blocko is a powerhouse in the private blockchain platform. Coinstack, a general-purpose blockchain platform where verification, security, index, smart contract and development environment necessary to build an enterprise environment are embedded, is a core product of Blocko. Based on this platform, corporate customers are provided such services as distributed database, data analysis solutions, certificate issuance solutions, hash and time stamp storage solutions and integrated verification solutions. Despite “Crypto Winter” hitting the cryptocurrency space, Blocko boasts its solid position thanks to its provision of services to a variety of companies and public institutions. “True, Blocko has a number of good references. 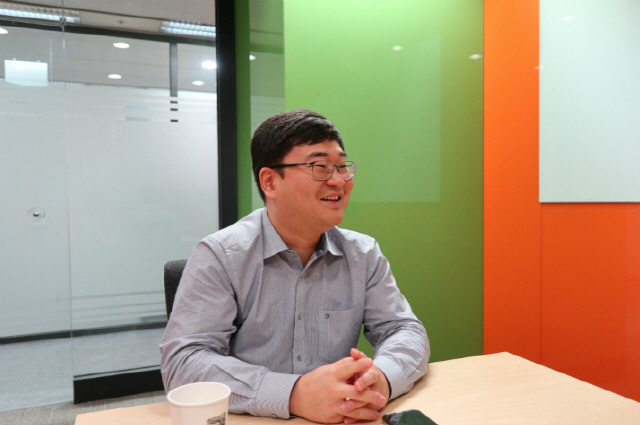 Block’s solutions, which have gone beyond PoC (proof of concept), are being connected with practical services,” said Blocko CEO Lee Jin-sok at the company’s headquarters in Bundang, south of Seoul, last week. Blocko secured the first blockchain reference in Korea by offering solutions to PayGate in 2015. Blocko takes pride in having a host of noted customers. They include such big companies as Samsung SDS, SK Telecom, Cisco, Posco ICT, Hyundai Motor, LG CNS and Doosan; financial firms like Korea Exchange, Hyundai Card, Lotte Card, Shinhan Bank and Korea Federation of Banks; and public institutions like Korea Internet & Security Agency, Public Procurement Service and Financial Security Institute. Lee predicted that changing the hegemony of data systems would be difficult, saying projects led by the government will pull ahead in terms of blockchain application. “Data are usually managed separately although projects belong to the same company or the same organization. It’s difficult to change the hegemony of data systems.” he said. Even in the same team, data concerning members, products and payments are managed separately and this sometimes can be a cause for conflict. Consequently, these inefficiencies result in hefty costs. Blocko, a category killer in the enterprise blockchain platform, was established Dec. 1 in 2014. Lee joined the company as chief technology officer in 2016 when Blocko received the Series A investment. He took over as co-CEOs of Blocko with Kim Won-beom in January last year. The number of Blocko’s employees grew to 90 as first-class talent converged.